The handle to this screwdriver is like a revolver barrel containing screw bits as bullets. Contains regular slot screw bits, phillips and posi-drive, especially selected to handle most screws you will come across. Professionals will appreciate this is tough, shock resistant and is designed to be pleasant to use. 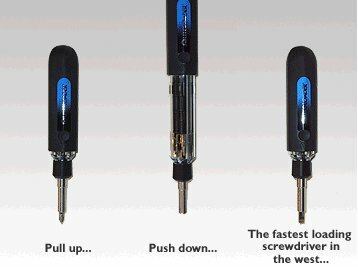 Auto Load Six In One Magnetic Bit Screwdriver text, images and video are copyright.